Definitely sounds like a good reason to not stick to the routine! Sometimes I find I can become almost legalistic with my routine, great example of being able to be flexible and keeping what’s important in perspective. Perfect timing! I love this encouragement because that’s how my last night went. I watched my friend’s son and once my three went to bed at 7pm the little one started to cry. The only way to console him was to hold him and then he fell fast asleep on me for an hour. and when he woke up he was unsure of where he was and cried for another hour. needless to say my 5 things did not get done. I did however go to bed ontime. Waking has been a struggle. And this morning my husband was kind enough to set the alarm for 6 but didn’t realize he set it for pm so i did not wake up until 7:04. But I made up for it at nap time and reorganized the dinner plan to something less involved. I really love this series. I just wish i could implement it more. I’m hoping that next week will be a new start for me with having two in school. I’ve found this series so encouraging and I’m glad that I reading this way past my bed time too! I knew also it was going to be a late night and I’ll for sure be sleeping in to get my rest to enjoy chasing my toddler around the house, crashing toy trucks and reading lots of stories! 🙂 Anyways thanks for encouraging me Crystal! You’ve got such perfect timing. I guess it is about that time to pick ourselves up. Thanks! Thanks for this! I fell off my bandwagon today, partly due to the lost dog I encountered on my run this morning. Thanks so much for this! I kind of fell off the bandwagon yesterday as well by going to sleep late and also my little daughter couldn’t sleep that well last night because she was getting over a sickness. But overall this series has really motivated me! I’ve been doing my evening must do’s almost every night and the mornings are a lot better too! I’ve decided what I want my morning plan of action is: get dressed etc, pray and read Bible, exercise 10-20 min and then get breakfast and morning chores started such as taking dishes out of the dishwasher and starting a load of laundry. My 2 toddlers are early risers sometimes, but even if they are awake I can just give them their morning milk and have them hopefully play quietly while I finish everything up. I’m excited to get this going! Thanks a bunch! I was able to get to bed on time, but I was not able to go to sleep right away. I was able to get all of my tasks done before bed. This morning I was a little sleepy because I did not sleep really good but I was determined to try to stay on track. So I started right into my morning tasks. For the second day I was able to get in my exercise. I had missed my exercise two days in a row. I would normally get upset with myself but this time I just determined to stick with it and make it a higher priority. I decided to make exercise one of my 5 morning tasks and that has really helped the last two days. I will keep all your suggestions in mind as I know I will fall off track off and on. It helps to have a plan to get right back on track. Love this! This past week has been super off for me. We’re overhauling my son’s feedings so that all of us, including him, can get more sleep and have a better schedule all around. However the process has thrown off our normal schedule and I feel a bit scattered. Great advice for times like this! I was thrown totally off track yesterday since my mom was in town. But I’m back at it this morning and got up at 5 like it was normal. In facet, I woke up just before my alarm did!!! So true and important to keep in mind! Thanks. I am in total agreement with you. This is just being flexible with your life! One day certainly does not equal “falling off the bandwagon”! I do determine my bedtime, but I often suffer from insomnia, so sometimes it is later than I wish! I am committed to waking up at 7 am. not as early as some people, but it works for me! It gives me an hour before school time to work! I have a morning plan of action….school, nature hike, canning peaches and baking and possibly visiting with friends. I see this as simply being flexible and handling what comes your way. Things come up, life happens, all days are not created equal. I don’t see it as “falling off the bandwagon” because, to me, that term implies failure. But a disruption to your routine certainly does not equal failure. If you get off track, give yourself the gift of a fresh start and simply start over tomorrow. Don’t look back to yesterday with regret. Gotta get on those Evening 5 Must-Do’s. I did manage to get up earlier on yesterday. I ate a decent breakfast. Wednesday night I did well to get in bed on time with all my evening must-dos done! Woohoo! The only thing is that I slept until 3 am and was having issues with back pain and stomach pain. I stayed up, but I did my morning routine different as I didn’t want a shower at 3 am. This back pain has been kicking my tail lately, and I haven’t been able to do as much. I have to tell myself to take it one day at a time and just do what I can. Much prayers appreciated for my back pain! Thanks again for the encouragement! We went to a dinner theater last night, which meant dashing home from work, changing clothes, heading right back out and getting home well after bedtime. So, the evening routine was a no-go…other than brushing my teeth and washing my face. And this morning was a crawl back in bed morning (after seeing my son off to school). BUT, I did exercise when I got up. And that always makes me feel better about the day. This is perfect for me today! I have a cold, I haven’t gotten a full night of sleep in 3 nights due to a combination of illness, bizarre cat behavior, and children… and I completely fell off the bandwagon. I am telling myself this is temporary, and I believe it will be. I am also definitely feeling the effects of not having done my evening routine last night! At this point I know I need to rest so I can get better. So I think I will be sleeping late tomorrow as well. But tonight I plan to get my evening routine accomplished! This couldn’t have come at a better time! This whole week has been plagued by a series of set backs. I gave myself some grace and just concentrate on getting my 5 items done at night. Next week will be better! I love this challenge, but it came at a bad time for our family. We are dealing with a serious medical issue that means lots of late nights and sleeping disruptions to take care of medicine and other needs. 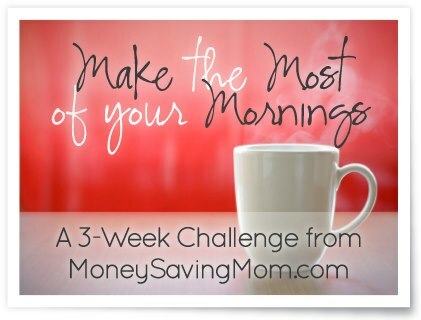 While I am following along the best I can, I hope you’ll put together a checklist at the end (like you have for the 4 Weeks to a More Organized Home challenge) for those of us who have had lots of bumps in the road during the past two weeks.